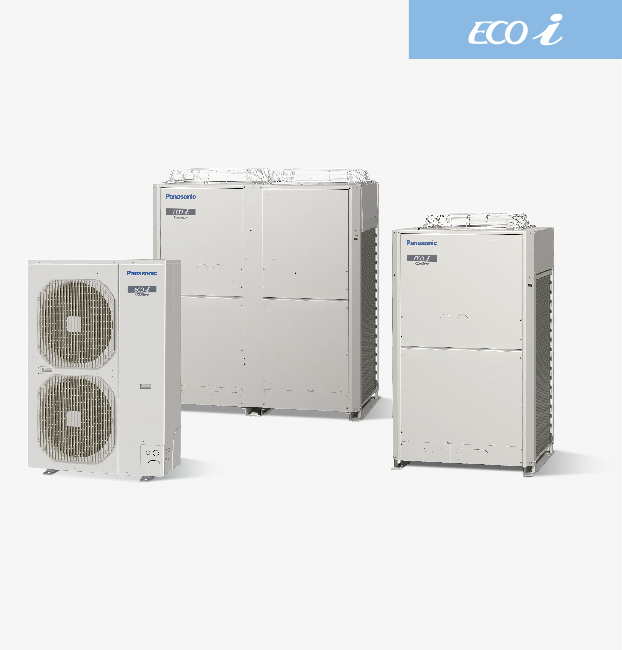 ECOi - VRF systems | KONDICIONIERI PANASONIC | KONDICIONIERIS PANASONIC | "SIA RIKON AC"
Panasonic ECOi 6N systems are amongst the most efficient VRF systems on the market, offering COPs in excess of 4,0 at full load conditions. The system is also designed to make sure that we reduce the running cost of each system by using our unique road map control routine to ensure that the most efficient combination of compressors are running at any one time. 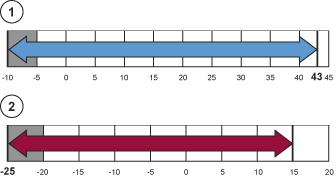 Improved defrost sequencing also reduces running costs by defrosting each outdoor coil in turn when conditions allow. High-efficiency and large-capacity VRF system. Large-capacity VRF systems using R410A with advanced technology. Newly designed next generation VRF! The operation efficiency has been improved using highly efficient R410A refrigerant, new DC inverter compressor, new DC motor and new design of heat exchanger. 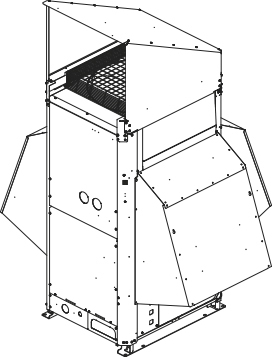 Heating operation range: Extended heating operation range enables heating even when outdoor temperature as low as -25°C. Using a wired remote control, indoor heating temperature range can be set from 16°C to 30°C. 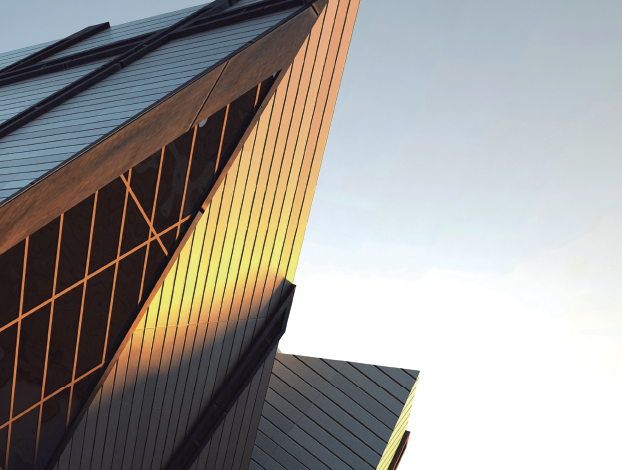 VRF systems attain maximum indoor unit connection capacity of up to 200 % of the unit’s connection range, depending on the outdoor and indoor models selected. So for a reasonable investment, VRF systems provide an ideal air conditioning solution for locations where full cooling/heating are not always required. A. System (HP) / B. Connectable indoor units: 130% / C. Connectable indoor units: 200%. If more than 100% indoor units are operated with a high load, the units may not perform at the rated capacity. For the details, please consult with an authorized Panasonic dealer. Newly designed fan and bell-mouth reduces stress to fan by dispersing fast wind speed. Thus, lower air resistance results in lower energy consumption. The turbulent flow (blue part) can be suppressed and the noise can be reduced. Even though the high speed circulation is utilized, the noise level is held at the same level as normal. * 40 m if the outdoor unit is below the indoor unit. 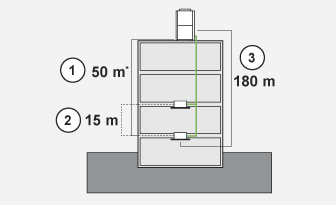 Difference between maximum and minimum pipe runs after first branch can be a maximum of 50 m; larger pipe runs can be up to 180 m.
In the event of an indoor unit malfunctioning, other indoor units can be set to continue operation even during maintenance. Backup operation is applied during in the case of emergencies. If error message is displayed, please contact your local service office. (Except for 8 HP single unit installation). This function limits the maximum operating input at peak time. 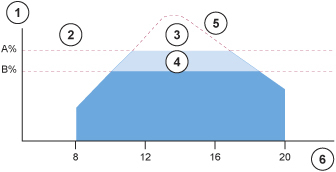 The limit value setting for level 1 & 2 can be changed from 40% ~ 100% by 5% when the system is commissioned. Demand control input signals sent to this outdoor interface will be transferred to the system via inter-unit control wiring. Other controls (ex. Operation ON/OFF, Mode switch Cool/Heat) are also available. Demand level 1 & 2 are available. DC-inverter control technology for rapid and powerful cooling & heating. The ECOi 6N series is designed for energy savings, easy installation, and high efficiency. Always continuing to evolve, Panasonic uses advanced technologies to meet the requirements of diverse situations and contribute to the creation of comfortable living spaces. Panasonic ECOi 6N systems are amongst the most efficient VRF systems on the market, offering COPs in excess of 4.0 at full load conditions. The system is also designed to make sure that we reduce the running cost of each system by using our unique road map control routine to ensure that the most efficient combination of compressors are running at any one time. Improved defrost sequencing also reduces running costs by defrosting each outdoor coil in turn when conditions allow. 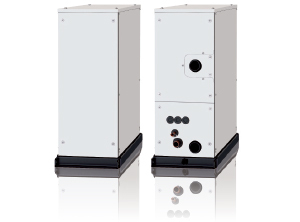 The range of outdoor unit modules consists of 7 models from 8 HP to 20 HP. The module sizes from 10 HP to 20 HP can be configured for HI-COP. Standard mode offers the highest capacity while still delivering excellent efficiency, while HI-COP mode delivers exceptional efficiency and low running costs with a slight reduction in capacity. Up to 64 indoor units can be connected up to a capacity of 200% indexed indoor unit loads, enabling the system to be used effectively on highly diversified building loads: this large connectability feature makes it an easy-to-design solution for schools, hotels, hospitals and other large buildings. Up to 1,000 m in pipe length enables the New VRF ECOi 6N series to be used in very large buildings, with maximum design flexibility. The ECOi 6N system is also easy to control. It has more than 8 types of control from standard wired remote controls to touch screen panels or web access interfaces. 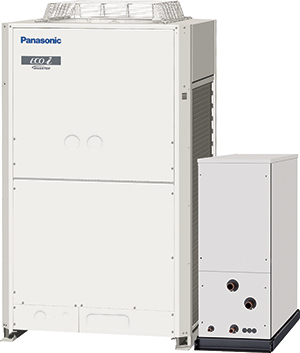 Panasonic’s policy of product development continues with the expansion of the Mini ECOi 6N, the 2-Pipe heat pump small VRF system specifically designed for the European market. The 2-Pipe ECOi 6N series is specifically designed for energy saving, easy installation and high efficiency performance as its main focus. R410A has a higher operating pressure with a lower pressure loss than previous refrigerants. This enables smaller pipe sizes to be used and allows reduced refrigerant charges. 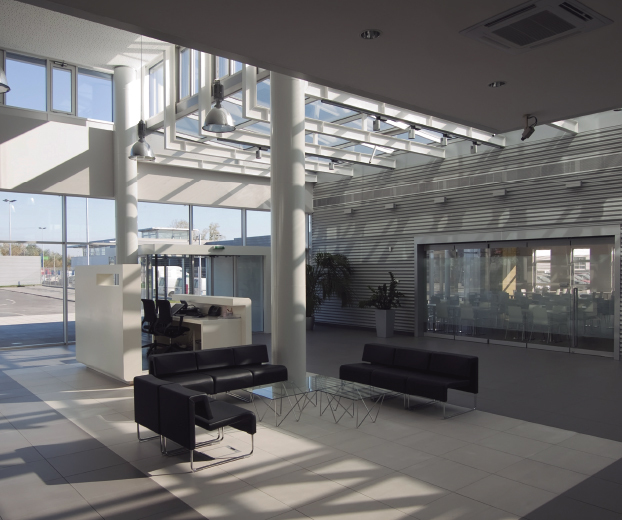 Panasonic recognise that designing, selecting and preparing a professional VRF quotation can be a time consuming and costly process, especially as it is often also a speculative exercise. So we have designed proprietary software which is quick and easy to use and produces a full schematic layout of pipework and controls, as well as a full materials list and performance data. A wide variety of control options are available to ensure that the ECOi 6N system provides the user with the degree of control that they desire, from simple room controllers through to state of the art BMS controls. 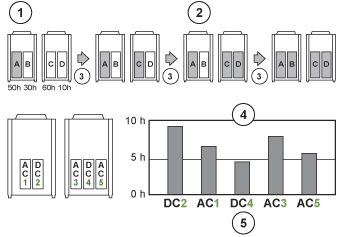 Simple set-up procedure including automatic addressing of connected indoor units. Configuration settings can be made from an outdoor unit or via a remote controller. To ensure that the compressor capacity is matched to building load as accurately and efficiently as possible, Panasonic has designed its range of 2 and 3-Pipe ECOi systems to operate with DC inverter and high‑efficiency fixed speed compressors. 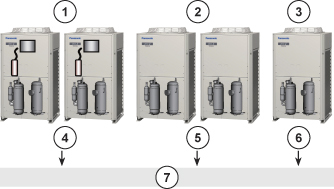 The system selects the most efficient compressor to operate by dynamically monitoring the building load and choosing the best compressor combination to run. The compact design of the ECOi 6N outdoor units means that sizes 8 HP to 12 HP fit into a standard lift and are easy to handle and position when on site. 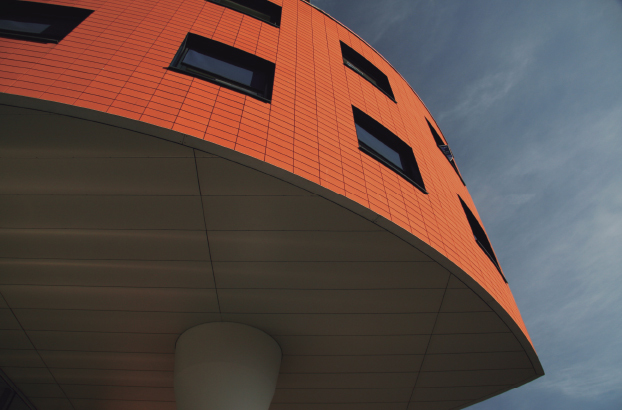 The small footprint and modular appearance of the units ensure a cohesive appearance to an installation. Panasonic ducted units offer the unique advantage of being able to offer off-coil temperature control as standard. 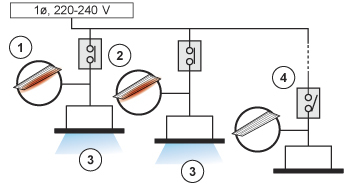 This allows designers to select units using an off coil temperature between 7 °C and 22 °C. This allows room environments to be cooled without subjecting its occupants to cold drafts or uncomfortable conditions. This is achieved without any extra controls or wiring to each unit. With 11 indoor model styles available, ECOi 6N systems are the ideal choice for multiple small capacity indoor unit installations, with the ability to connect up to 40 indoor units to systems of 24 HP or greater for 3-Pipe ECOi MF2 series. Each system allows the use of prognostic and diagnostic controls routines, from refrigerant charge control through to complex fault code diagnostics, all designed to reduce the speed of maintenance calls and unit down time. Panasonic ECOi 6N systems are amongst the most efficient VRF systems on the market. The system is also designed to make sure that we reduce the running cost of each system by using our unique road map control routine to ensure that the most efficient combination of compressors are running at any one time. Improved defrost sequencing also reduces running costs by defrosting each outdoor coil in turn when conditions allow. Panasonic ducted units offer the unique advantage of being able to offer off-coil temperature control as standard. This allows designers to select units using an off coil temperature between 7°C and 22°C. This allows room environments to be cooled without subjecting its occupants to cold drafts or uncomfortable conditions. This is achieved without any extra controls or wiring to each unit. 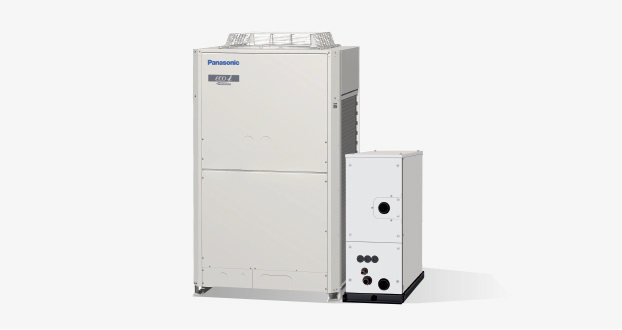 The Panasonic solution for chilled and hot water production! With this easy to install Water Heat Exchanger unit, you can now cover projects up to 51 kW hot water demand or 44 kW on chilled application on a efficient way and cost effective. A Buffer Tank of minimum 500l is always needed. Unique 4 way valve in order always have counterflow fluid circulation in heating and cooling fluid circulation on both sides of the cross flow. This optimizes efficiency!